Have you ever heard of Katie from Chocolate Covered Katie? I found her a few years ago when I was searching for baking recipes that were dairy free for The Kid. Katie is vegan so her recipes fit the criteria and they are pretty creative. She does use some different flours like spelt, but I can easily work around that and unlike some other sites she also gives substitutions if she knows them. I pulled out ingredients that were similar to those in the original recipe and nuked up my own version. After it was done, I flipped it out onto a plate and that’s when I saw it. A sign from Cupid on the top of my mugcake! I kid you not. It was totally random and unplanned, but completely appropriate for the love I feel for mugcakes. Spray a plastic container or mug lightly with non-stick spray. The plastic container I used was an 8 oz round one. Mix all the ingredients except the Quest Bar in a small bowl. You may need to add just a splash more water to make a batter consistency. Pour half the batter into the prepared container or mug. Press the Quest Bar gently into the batter and cover with the remaining batter. Microwave for 60 – 90 seconds until the top is just barely dry. Don’t microwave too long or it will be as dry as a sponge. Use great restraint and let it cool for about 5 minutes and enjoy. 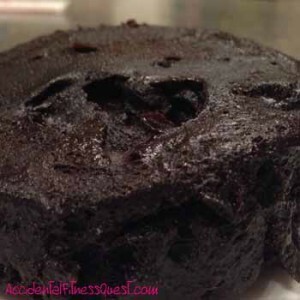 Makes one incredibly chocolate flavored mug cake at approximately 210 calories – 16g protein, 36g carbs, and 5g fat if you use the ingredients I used above. This recipe has plenty of room to make substitutes based on what you currently have on hand. Use regular baking cocoa instead of the dark. Sugar instead of stevia. Use vanilla, almond, or other extract instead of butter. Use regular, soy or other milk instead of almond milk. Use banana, pumpkin or applesauce instead of the butternut squash. For the fillings, go wild! Use a different flavor Quest Bar. 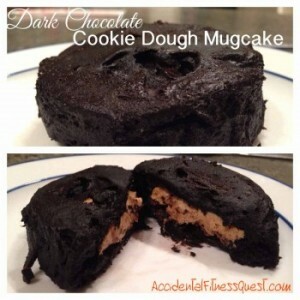 Use an oreo, fruit, protein bar, mini candy bar, a blob of a different flavor protein powder mixed with water. If you find a heart on the top of your mugcake, you must come back and leave a comment. Share the love. If you’re interested in working with me to get meals together fast while working towards your health goals and feeding a family, I’d love to chat. You don’t have to and shouldn’t eat differently while dieting than the rest of your family. Drop me an email, or come on over to Facebook and ask a question.